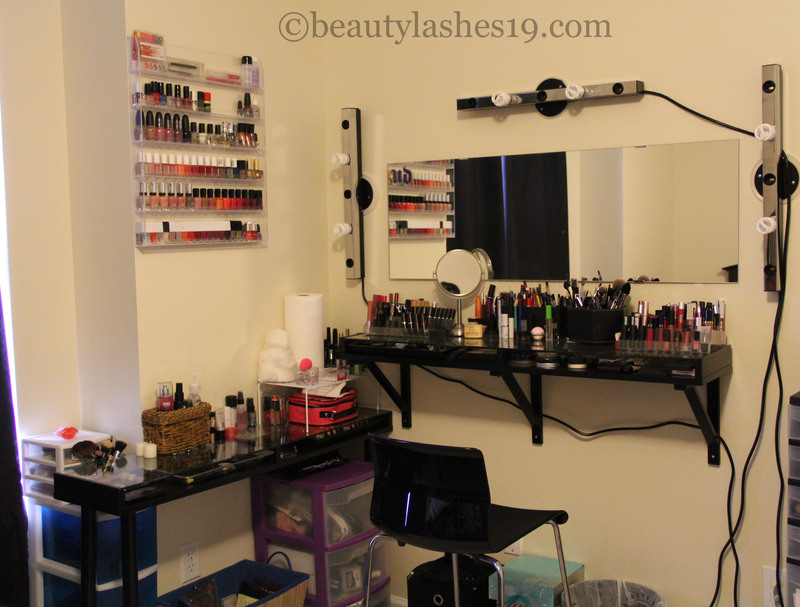 Hey guys, Today I am sharing with you my vanity setup at the new place.. I hope you enjoy.. Do let me know if you have any specific questions.. 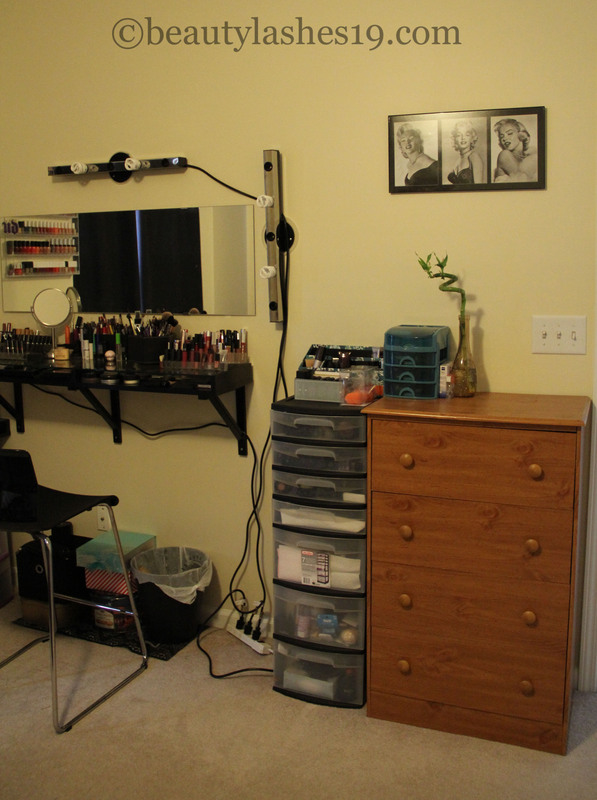 I have two of the Ikea Ekby Gruvan shelves (http://www.ikea.com/us/en/catalog/products/30193304/) arranged in an L-shape as my vanity table… What I really like about these is that the glass top enables me to see what I have and use more of the stuff I own.. One of the shelves is on the wall with the help of shelf brackets while for the other one, I purchased legs from Ikea and added them onto the shelf.. For the purposes of this post I’ll refer to the one with legs as the left shelf while the other one on the wall is the right shelf.. The lighting – MUSIK wall lamps, chair and mirror are also from Ikea (http://www.ikea.com/us/en/catalog/products/30113029/)..
On the floor, I have a mesh basket with most of my palettes – eyeshadow and contour/blush palettes.. On the right side, I have my waste basket, my travel bags/containers and random boxes filled with goodies I don’t use regularly (extra concealers, more palettes, face products, etc).. I also have a nail polish rack on one of the walls.. Here is a closer look.. Behind and under the left shelf, I have two sets of cheap plastic drawers at the moment for storing mostly skincare products.. On top of that, I have a glass jar where I store my dirty brushes that need washing.. On top of the left shelf, I have my setting spray, hand sanitizer, brush cleaners, liquid highlighters, tape, some drugstore lip glosses/creams, cotton, beautyblender, roll of bounty, q-tips, mascaras that I am not using at the moment and my travel bag (pink and black).. Under that glass top, I have laid out all my pigments, face products such as highlighters and contour products, eyeshadow bases, cream shadows, Hourglass ambient lighting palette, spatula, mixing palette, a pair of small scissors, tweezers, etc.. Onto the right side now.. Here I have most of my lip products laid out in lipstick holders.. I really like seeing the color or name.. It helps me pick the right shade I need.. All the lipsticks and lip stains are on the left while the lip glosses and lip balmy products are on the right.. I also have a holder in the center carrying all my lip and eye pencils.. I also have a magnifying mirror, ben nye banana powder, benefit powderflage powder, my trusted and much loved NARS pro-prime eye primer, smashbox photo finish primer, maybelline clear mascara (for brows), etc.. I also have the mascaras I am currently using out here.. Under the glass top, I have all my single eyeshadows, my Z-palette with favorite neutral eyeshadows, my MAC palette with blushes and contour powder, 3 palettes I am loving at the moment (Lorac pro, IT cosmetics naturally pretty and Smashbox Photo Op eye enhancing palette for brown eyes), Chanel Soleil Tan de chanel, a few powder highlighters, MUFE concealer, Laura Mercier secret camouflage concealer, It cosmetics bye bye pores powder, skindinavia setting spray, etc.. Most of my every day products are on this right shelf..
On the right of this shelf is another set of plastic drawers from Walmart.. I have all my single blushes in the top drawer.. The other drawers have extra eye primers (that haven’t worked for me), extra face primers, other face brushes, other eye brushes, fake lashes, face masks, hair products, etc.. I have all my foundations and extra beauty blender/sponges in containers on top of this drawer set.. In another corner of the room, I have all my perfumes and jewelry on top of my dresser.. I have another nail polish rack in this corner..